I even emailed a few friends last week to discuss my thoughts about possibly dropping down to a shorter distance (as it turns out many racers did). Luckily along with my vote the ruling was to stick with the long course race. 1) I am training for Powerman Zofingen (for which this race is modeled after) in September, and 2) once I put it out there that I’m racing long course I don’t want to back down! I knew that completing the distance wouldn’t be an issue – my bigger concern was how much of a hole I would put myself into with my first 50 miler (2nd attempt) only 2 weeks after. It was time to come up with a smart race plan and execute it. And that’s just what I did. My next concern was the heat. Yes I’ve talked about my infamous heat stroke quite a bit and you’re probably sick of hearing about it but it was honestly the scariest thing that has ever happened to me athletically and it is something I take very seriously. On top of that I have dropped out of 3 races since then due to heat, and that is 3 races too many for me! The temps for today were set to reach 87 along with high humidity. Add to that a very challenging course and I knew I had to pay much attention to how I was feeling. Speaking of the course, let me give you a quick rundown. It starts with a 5 mile trail run at Spring Farm in Mohonk Preserve. The 5 mile loop contains 900 feet of climbing. You run through grass fields, over wood plank bridges, through single track, over rock and root-filled ascents and descents, and the best part – the forgiving carriage roads. Next you head out on the bike for 3 loops totaling 84 miles, with 8,406 feet total climbing. The toughest climb greets you right as you leave the park so you better finish that run feeling good! It was a very small start line for the long course athletes who went off at 7:00 am – the F1 (middle course) distance is the most popular event featuring a 5 mile run/29 mile bike/5 mile run/29 mile bike/5 mile. After the bagpipe played the National Anthem we were off to woods! The pace was totally relaxed and it felt great. I knew the key to this race was to take it easy on that first run and I picked the right person to keep me in check – last year’s winner Colin Martin. I was loving the course and loving the pace – the first 3 miles have the toughest climbs and for the last 2 you can really settle in. I finished my first run in 39:18 and was feeling awesome! Time to head out on the bike with a plan – hold back. After tackling that first climb you meet an equally intense descent. Saturday night’s rain left us with foggy conditions and wet roads this morning and I found myself being extremely cautious – hoping that by the 2nd loop I could have a little more fun here. Otherwise loop 1 was uneventful – I settled in and focused on not worrying about what was happening behind me. Having trained on this course I felt very comfortable with the terrain which was definitely a benefit going into this race. My goal was to make it through lap 1 without being passed (by females) and I was thrilled to make it to the park meeting that goal. Out onto loop 2 – that first climb felt tougher but I tried not to think about the fact that I would need to tackle it one more time. The fog had lifted and the roads were drying so I was able to open up a bit more on the descent. Next it was time to settle into the long trek up to Minnewaska. I felt stronger than I had on the first loop and this was a huge mental boost for me. But now it was time to focus on my hydration plan. Racers were alerted the day before the race that the nutrition/hydration sponsor failed to send the supplies the race organizers needed to stock this race. They would have bottles of water and limited bottles of Heed on the course. This meant I would be stopping to mix my own bottles of hydration – not ideal but worth it for me to take the time in order to have what I really need in these conditions. I arrived at the bottle exchange on loop 2 and pulled over to see what was available. Luckily they had a bottle of Heed so I dropped my 2 empty bottles in exchange for 1 bottle of water and 1 bottle of Heed. The problem was that the replacement bottles were tall, but instead of taking the time to dump the contents into my existing (smaller) bottles I worked one into the bottle holder on my tiny frame and placed the water into my cage between my aerobars. This went smoothly and off I pedaled. Not even 1/4 mile down the road I hit a bump and the bottle between my bars launched – it was too tall to properly sit in there. I stopped and turned around to retrieve it thinking it was not a good idea to go without. As I picked it up off the side of the road the water was gushing out of it – the bottle had cracked and was useless. Oh well – I wasn’t going to go back to the water exchange – I could make it to the next exchange with the bottle of Heed. I saw more of these bottles on the road along the way – I think other riders had the same fate. Finishing loop 2 I swapped the empty Heed bottle for 1 bottle of water. No point in trying to place another one between my bars and this also wasn’t the place to stop and mix a drink as I was about to climb the toughest section for the last time (yay!). Although a snafu with my Garmin didn’t allow me to track each loop of the bike, I am sure this final loop was my slowest. But I was still holding the lead and was now determined to make it through the 84 mile ride in first place. I was very happy to get to that last aid station so I could grab a new bottle and mix what I now believe was my secret weapon in beating the heat at this race. I pulled over for a bottle and ripped open my tube of Skratch Labs Hyper Hydration Mix and it was like an egg timer slowly emptying into my bottle. I was at that anxious point of the race feeling like there would be someone coming up right behind me so I impatiently forced about 3/4 of the package into my bottle and was on my way! The plan was to drink that whole bottle down before I finished the bike. Normally I consume 100-150 calories per hour on the bike but with a race of this length I decided I should aim for higher. I decided on 200-250 calories per hour on the bike. I wasn’t sure how this would work for me because I have a hard time taking in calories in that kind of heat but I stuck to the plan and I’m glad I did. I was so excited to see that aid station one last time as I turned into the park to transition to the run under my goal time for the bike. The transition was smooth and I grabbed my hand-held bottle of the Skratch Labs Hyper Hydration mix that I had prepared anticipating a great need for it during the run. 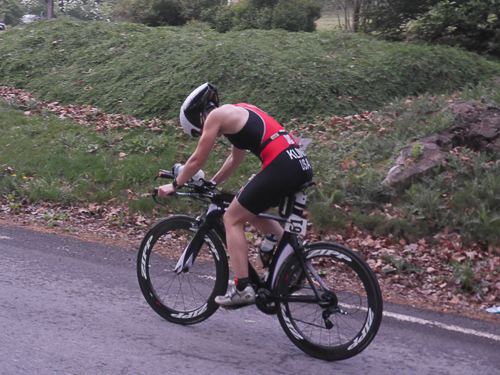 I was really excited to be off the bike and moving onto my strength. That excitement disappeared super-quick as soon as I made my way through the torturous gazebo and out onto the loop. The gazebo is agonizing because you pass through it every loop while the racers from the 2 other distances are enjoying the post-race party. It is great to have a cheering section but when you have to go back out there and run that loop, and then again, and then again…it is tough! Back to my legs – they were feeling nothing short of tanked. I felt really good about my bike and now I was experiencing the fallout from the effort and distance that I was not trained for. I couldn’t prevent the negative talk from creeping in. If I felt this bad during mile 1 of this 15 mile run, I could very easily destroy my whole race. I stuck with the plan of power-hiking the steep climbs. I mean, that’s all I could do at this point. Minus the “power” part. Seeing that first aid station was like a desert oasis – I was stumbling in, trying to take in a gel, and unable to answer the extremely helpful volunteers who were offering me drinks. I took a few seconds to drink a full cup of water and then dump a full one over my head. I did this at every single stop (3 per loop) through the rest of the race while also nursing the bottle of Skratch. After leaving that first aid station I started to perk up and by mile 3 I was finally starting to come around. Yes! I’m back! Finishing that first loop I looked at the race clock and felt confident enough to change my race goal to 8:15. If I could continue the next 2 loops at the effort I finally found at the end of the 1st one, I could do this! And that’s exactly how it went. At each aid station I took the time to get what I needed to keep me going. During both the 2nd and 3rd loops Jared told me my lead was 25 minutes. Although I wasn’t running strong by any means I now knew that I could back off even more. I had the 50-miler in 2 weeks to think about. And think about it I did. If I am feeling like this at Cayuga, will I back off and just finish? NO! I will power through and finish as strong as my body will allow. So that’s what I did. Around mile 3 you have the long steady downhill on carriage roads and I ran that section conservatively throughout the race to save my quads. Now I picked it up – time to leave it out there and get that time goal. When I came around the corner with the gazebo in sight I saw 8:14 on the race clock. Yes! As far as I could look back at results, the 2nd fastest time for this race was 8:34:55 in 2006. I have no idea if this race course has changed over the years. Do I have a course record? I don’t know. I am extremely happy with this race because I executed my race plan and I conquered the heat. 2 big wins! 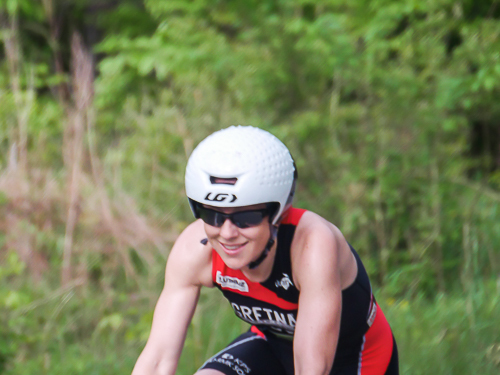 And now I feel like I have a great practice race under my belt for the main event – Powerman Zofingen – in September! If you haven’t seen it yet, check out this cool race video! Congrats to everyone who endured that heat on a tough course! 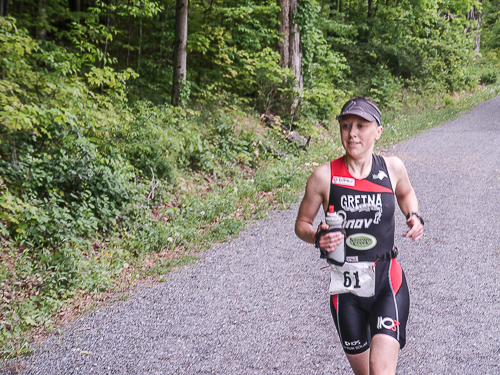 This entry was posted in duathlon, race, race report and tagged American Zofingen, American Zofingen 2015, duathlon, Powerman Zofingen, race, race report, racing, Skratch Labs, Skratch Labs Hyper Hydration Mix, trail running by lljkline. Bookmark the permalink.